The presence of Candida spp. in the urine is common and does not necessarily represent infection. 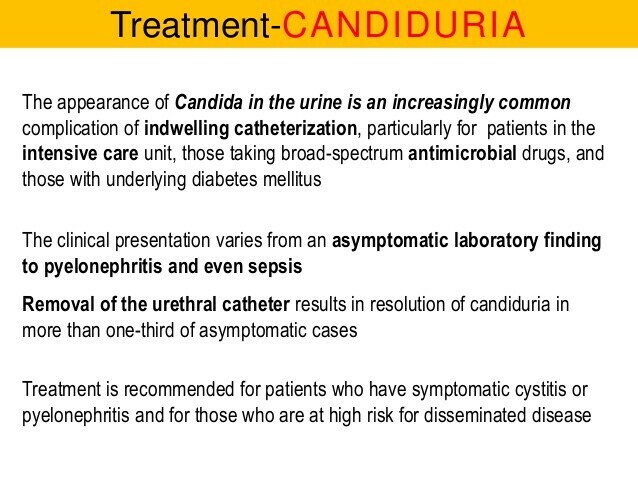 Candiduria is commonly associated with antibiotic use, indwelling urinary catheters, and diabetes mellitus and frequently resolves if predisposing factors can be corrected. 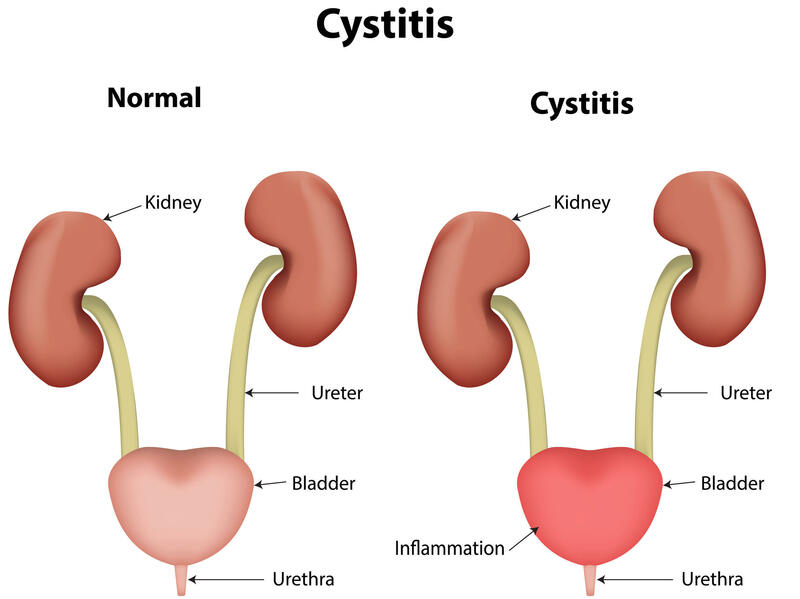 Patients are generally asymptomatic, although some will have symptoms similar to bacterial cystitis, with dysuria, frequency, and urgency (Box 2). Urinalysis shows fungal elements and may reveal pyuria. At cystoscopy, the mucosa of the bladder typically has an inflamed appearance with adherent white plaques that may be removed with the scope. Candida spp. may also cause urethritis, typically in male sexual partners of women with vaginal Candida infection, as well as higher urinary tract infection. The upper urinary tract and renal parenchyma may be infected from ascending infection or, more commonly, from hematogenous spread as part of a syndrome of disseminated candidiasis. With ascending infection, perinephric abscesses, papillary necrosis, fungus balls, and calyceal involvement have all been described. Risk factors are generally present and include diabetes mellitus, urinary tract obstruction, and renal stones. With hematogenous spread, the renal parenchyma becomes studded with multiple microabscesses. Candiduria is usually discovered when a urine culture reveals the presence of Candida spp. The presence of pyuria generally indicates true infection if other etiologies, such as bacterial infection, have been excluded. Infection may also be diagnosed by demonstrating the presence of a typical appearing fungus in biopsy specimens obtained during cystoscopy. Of particular importance for treatment is whether candiduria represents colonization or true infection, and whether the upper urinary tract is involved, a distinction that can be troublesome. Those with risk factors for ascending infection (diabetes, stones) and those at risk for disseminated disease are more likely to have upper urinary tract infection. Computerized tomographic scans or ultrasound may reveal microabscesses or fungus balls. When treating Candida infection of the urinary tract, careful consideration must be given to whether candiduria represents colonization or true infection, and whether the upper urinary tract is involved. Asymptomatic candiduria usually does not require antifungal treatment, but indwelling catheters should be removed as soon as possible. (Treatment is summarized in Box 6.) In the presence of pyuria, diabetes mellitus, or renal transplantation, treatment is indicated. Oral fluconazole is recommended as the initial agent. Bladder irrigation with amphotericin B is also effective. Patients with candiduria should be treated prior to instrumentation of the urinary tract. In patients with evidence of systemic toxicity, Candida infection at other sites, risk factors for ascending infection (structural or metabolic abnormality of the urinary tract such as stones or diabetes), or risk factors for disseminated candidiasis (burns, neutropenia, or GI surgery), consideration must be given to the possibility of upper urinary tract infection or disseminated candidiasis. Upper urinary tract involvement usually will respond to oral fluconazole, although intravenous amphotericin B is required for infections resistant to fluconazole or unresponsive to initial fluconazole treatment. Fungus balls and large perinephric abscesses may require surgical intervention. Treatment of disseminated candidiasis is discussed next.